How to add a comment and practice question to an Interactive Document, Interactive Video or Interactive Audio? In an Interactive Document, - Video or - Audio, both teachers and students are able to add practice questions and comments. As a teacher you can disable one of the two options for your students, please see the set up guide of the tool to see how. Clicking the '+' button within a document, video or audio file, gives you the option to add a comment or a practice question. The '+' button shows when selecting part of the text or scrolling over the timeline. There is also a '+' button in the lower right corner of the display: this will add an overall practice question or comment, not specifically linked to a certain part in the file. In this article, adding questions and comments is explained in the example of Interactive Document. When you click practice question, you will have to choose between an open question or a multiple choice question. For open questions you enter the question and the correct answer (see screenshot below for an example). Peers or students will see your answer after they have entered their answer to the question. They will then indicate if they answered the question correctly, almost correctly, or wrongly. When you click practice question, you will have to choose between an open question or a multiple choice question. For open questions you will have to enter the question and the correct answer (see screenshot below for an example). Peers or students will see your answer after they have entered their answer to the question. They will then indicate if they answered the question correctly, almost correctly, or wrongly. 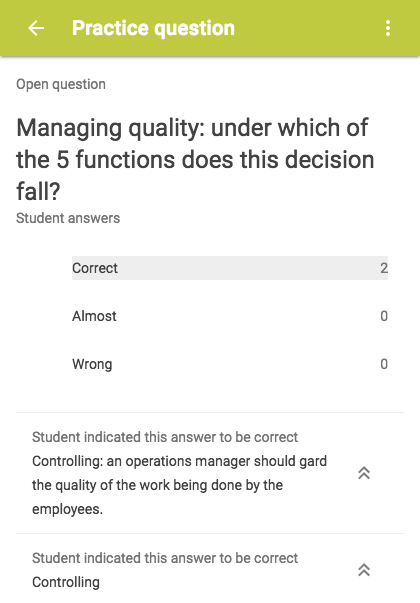 If you enable the option students are required to answer this question before continuing the document, the parts of the document that come after the question will be hidden from students' view until they answer the question. Note that the question doesn't have to be answered correctly to continue reading. As a student you do not have this option, peers will always be able to skip the question. Click publish to add the question to the document. Note that the question will not be saved if you do not publish it. As a teacher you will get an anonymised overview per question of answers received and how many students indicated their answer as right or wrong. 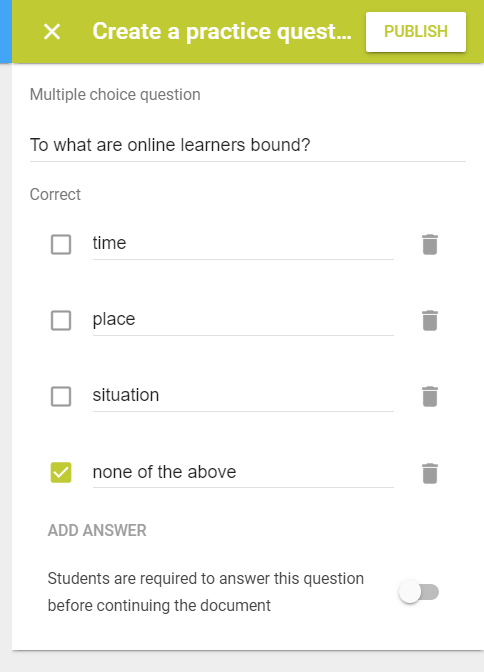 Even if a student was the one to create the practice question, the teacher is the only one with the complete overview of indicated correct answers. Answers of students are also shown to peers, anonymised and it is not possible to respond to each others answers. write your question and fill in the answer options (see screenshot below for an example). Click add answer to add more options. Tick the box next to the correct answer. If several answers are correct, you can tick multiple boxes. 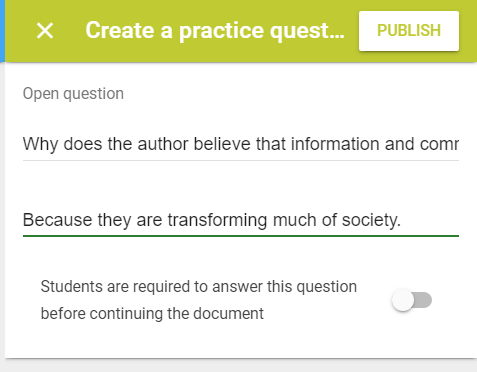 If you enable the option students are required to answer this question before continuing the document, the parts of the document that come after the question will be hidden from students' view until they answer the question. Note that the question doesn't have to be answered correctly to continue reading. Click Publish to save your question and add it to the document. select the appropriate section of the document by dragging a box around it and click comment. 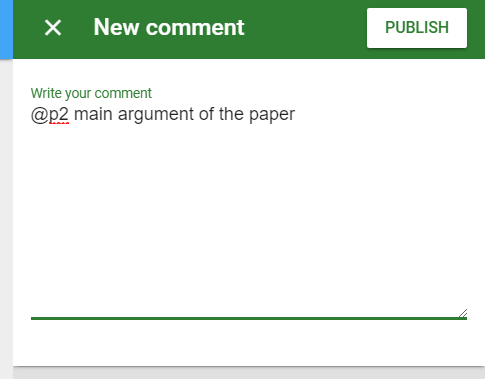 Next, write your comment (see screenshot below for an example) in the right sidebar and click publish to save your comment and add it to the document. If you want to add a practice question or comment that concerns the text as a whole rather than a specific passage, click the blue + button in the bottom right corner of the document and add your question/comment. Note that if you add a practice question in this way, you will not have the option to require students to answer the question before they can continue the document. Both teacher and students are able to upvote practice questions, comments and each others replies to comments. As a teacher you are able to upvote answers of students to practice questions. Both teacher and students are able to respond to comments. 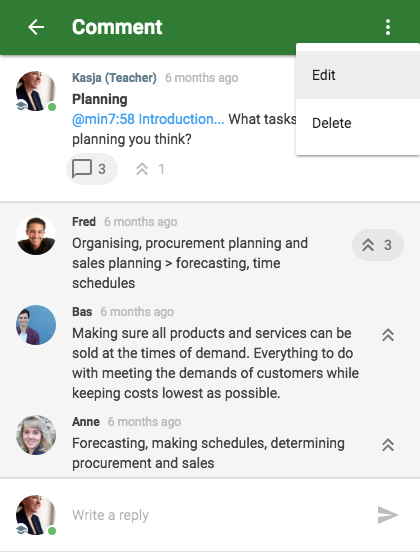 Both teacher and students are able to edit or delete their own comments, practice questions or replies to comments. Clicking the blue-link will navigate you to the right part in the document of video where the comment or practice question was inserted.